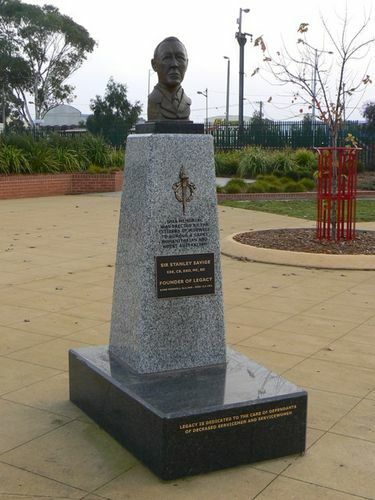 A portrait bust on a pedestal commemorates former soldier, Sir Stanley Savige, founder of Legacy who was born in Morwell. Stanley Savige fought at Gallipoli, then commanded the operation that saved 50,000 Assyrian refugees from certain death in the Middle East and went on to found Legacy - an organisation still providing aid to families of service men and women. In a distinguished military career spanning two world wars, Stanley became Lieutenant General Sir Stanley George Savige, one of Australia’s most decorated soldiers. A Distinguished Service Order (DSO) was awarded to Captain Stanley Savige for conspicuous gallantry and devotion to duty during the retirement of Assyrian refugees from Sain Keleh to Tikkan Tappah between 26th and 28th July 1918; also at Chalkaman on the 5th and 6th August 1918. Legacy founder Sir Stanley Savige was finally immortalised in his birthplace, Morwell, today. Sir Stanley’s place in the history of the region was recognised with the unveiling of a bronze bust memorial. The memorial, a bust on a large granite pedestal, takes pride of place in the new town square between Commercial Road and Princes Drive, which will be known as Legacy Place. The project to recognise Sir Stanley with a fitting memorial started three years ago with Advance Morwell treasurer Max Williamson. After seeking approvals Advance Morwell raised $16,000 for the project, which was completed yesterday ready for today’s unveiling. According to Mr. Williamson, the memorial is close to Sir Stanley’s birthplace which is believed to be Tarwin Street, 116 years ago. “He has many memorials around Australia recognising his achievements but this one is more special because it is his birthplace,” Mr. Williamson said. Mr. Williamson said there was still some work to be done with information signage about Sir Stanley planned for Legacy Place. He hopes it will give locals a greater understanding of the achievements of one of our own. Morwell – born Sir Stanley enlisted in the First Australian Imperial Forces in 1915 and landed in Gallipoli that year. He was commissioned at Lone Pine and commanded one of his battalion’s rearguard parties during the evacuation. In 1916 he was posted to France where he was awarded the Military Cross. He was sent to the Middle East in 1918 and was awarded the Distinguished Service Order later that year. He married in 1919 and, in 1923, founded Legacy in Melbourne, which cares for the children and widows of deceased servicemen. “For the next 26 years, due to his commitment, energy and enthusiasm, Savige’s name became inseparable from both the club and the movement,” according to Legacy’s web. Latrobe Valley Express (VIC), 31 August 2006. Born Morwell 26.6.1890 - Died 15.5.1954. A Distinguished Service Order (DSO) was awarded to Captain Stanley Savige, for conspicuous gallantry and devotion to duty during the retirement of Assyrian refugees from Sain Keleh to Tikkan Tappah between 26th and 28th July 1918; also at Chalkaman on the 5th and 6th August 1918. He was in command of a small party sent to protect the rear of the column of refugees who being hard pressed by the enemy. By his energy, resource and able dispositions the hostile troops, many of whom were mounted, were kept at a distance, although in greatly superior force. He hung on to position after position until nearly surrounded, but on each occasion extricated his command most skilfully. His cool determination and fine example under fire inspired his men and put heart into the almost panic stricken refugees, thereby averting what might have been a very serious situation.